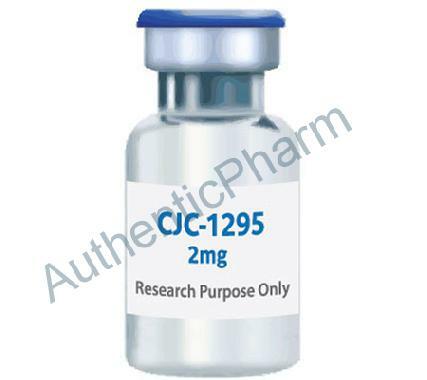 CJC-1295 is a synthetic modification of growth hormone releasing factor (GRF) with D-Ala, Gln, Ala, and Leu substitutions at positions 2, 8, 15, and 27 respectively. These substitutions create a much more stable peptide with the substitution at position 2 to prevent DPP-IV cleavage, position 8 to reduce asparagine rearrangement or amide hydrolysis to aspartic acid, position 15 to enhance bioactivity, and position 27 to prevent methionine oxidation. CJC-1295 is a Long acting GHRH analog. Growth-hormone-releasing hormone (GHRH), also known as growth-hormone-releasing factor (GRF or GHRF) or somatocrinin, is a 44-amino acid peptide hormone produced in the hypothalamus by the arcuate nucleus. GHRH stimulates growth hormone (GH) secretion from the pituitary. GHRH is released in a pulsatile manner, stimulating pulsatile release of GH respectively. This substance also promotes slow wave sleep. The active portion of this GRF or GHRH peptide can be found as a 29 amino acid long peptide and is appropriately named GHRH1-29. This pulsatile release of various peptides is due to the negative feedback loop that is part of the hGH axis and controls the amount of hGH that your body produces to keep it in a homeostatic environment. Various experiments have been conducted to test the effectiveness of CJC-1295 in vivo and the Journal of Clinical Endocrinology & Metabolism has reported dose-dependent increases in mean plasma GH concentrations by 2-10 fold for more than 6 days and increased IGF-1 concentrations 1.5-3 fold for 9-11 days after a single injection.